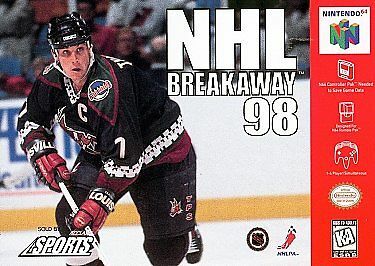 Hit the ice with NHL Breakaway '98! All 26 NHL teams and over 600 players from the NHLPA. Variable player sizes, from hulking defensemen down to speedy wingers. Playbook based AI, so teams play their actual styles - forecheck, trap, dump and chase. Five gameplay modes: Exhibition, Season, Playoffs, Practice and Shoot-Out modes. Create players - assigned name actually appears on the player's jersey. Season wins provide bonus points which improve coaching, player development, injury therapies and more.